Enjoying our backyard birds can be more than just watching them outside. We can also use them as part of our home decor. Backyard bird drink coasters make a simple way to do this. A useful and decorative item, a coaster makes a great gift for bird-loving friends and relatives, too. 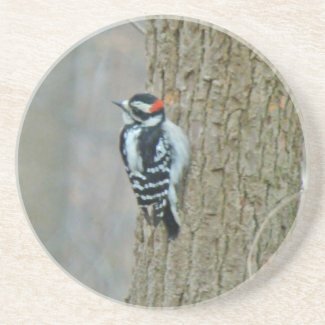 The most common backyard birds are some of my favorites to use for decor items in my home. Birds like the Northern Cardinal, the Eastern Bluebird and the Goldfinch make charming and colorful accents. There are multiple varieties of the woodpecker bird species. Some of these can find their way into our own backyards. Even if a woodpecker isn’t among your viewed birds, one may still be tucked in the trees nearby. Both the Downy and the Red-Headed Woodpecker are part of my world. The beverage coasters I’ve featured here are of 2 different styles. The round ones are sandstone. The look of the image is soft and muted. This style works great for a more formal room, but also works great as a casual addition to your home decor. The square coasters are made from a high-gloss plastic with a cork backing. The images displayed are vibrant and bold. The best part, they wipe clean. That works for me in just about any room in my home. Plus, these drink coasters come as a set of 6. Which makes them delightful home gifts for bird-lovers. Have you been successful at capturing photos of birds in your own backyard? You can turn them into your own special beverage coasters. Create your own just by uploading your photo. Zazzle.com makes it easy for you. You don’t even need any fancy technical skills. You just need your photo saved to your computer. After you add the photo, try adding some text. Maybe your monogram, the date and location of the photo, anything you like. You can play with the font, the color, the size and the position of your text. When you like what you see, order it for yourself, or as a gift. It’s amazingly easy. So, whether you prefer the beautiful looks shown here, or you want to create your own, get a set of backyard bird drink coasters to add to your home decor. I’d forgotten all about how you can personalize things through Zazzle. What a really cool idea to create my own coasters! Birds, grandkids, pets, anything! Thanks for a great tip! I love to have more than one style of coasters and switch them out for a change of decor and pace! These bird coasters are really nice. These coasters are really beautiful and a great way to bring in the outdoors while protecting the indoor furniture!